You may have wondered what Africans eat and what their traditional African food looks like. Maize and Meat are the cornerstones of the traditional African food menu. Since early days the black South Africans have been agrarians. Although not indigenous, maize is the number one staple food in Southern Africa. It has its origins in South America, from where explorers and discoverers introduced it to other parts of the world and also the African continent, where it became a highly popular and widely spread agricultural product. Sorghum and Millet were crops just as important as maize, mainly used for the making of the traditional African beer. Number one on the list of popular African dishes is "mieliepap" (maize meal porridge). It is enjoyed by all South Africans, whether black or white. Although porridge is porridge, there are quite a few differences in the way people prefer it. Cooking "mieliepap" in a pot, as in the days of old. The types of "mieliepap" as we know it today, are "stywe pap" (stif maize meal porridge), fine-grained, firm and smooth, almost a bit doughy and "krummel pap" also stif, but drier, rough-grained, and crumbly. For breakfast "mieliepap" is enjoyed in a more liquid and runny form, with milk, butter, cream and sugar. The firm "mieliepap" (maize meal porridge) is traditionally eaten by hand, taking a peace from the cooking pot and dipping it in a tasty sauce. The sauce is made from a variety of savouries called "shebu", made from green vegetables and chillies and sometimes peanuts are added. 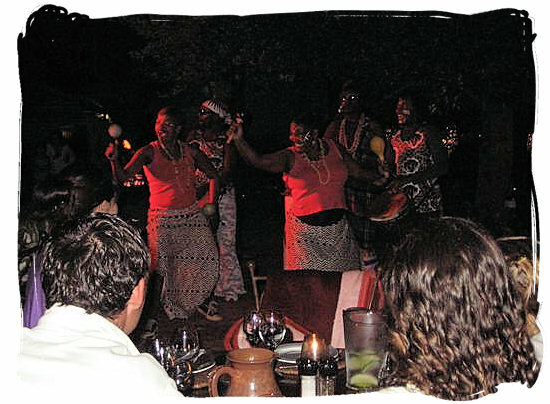 Indigenous african dancers performing in one of the Moyo traditional African restaurants. There is one in the market Theatre and in Newtown in Johannesburg and one at the Spier Estate near Stellenbosch in the Cape. In the old days, next to hunting, most of the meat supply came from domesticated herds of goats and cattle and much later also sheep. The meat was grilled over open fire or stewed in a three-legged "potjie" ( cast iron cooking pot). African restaurants today still serve it that way, accompanied by a variety of vegetables such as beetroot, carrots, cabbage, onions, potatoes and morogo amongst others. In rural communities people gather weeds such as blackjack, purslane, pigweed, thistle or goosefoot and many others and turn them into delicious stews. 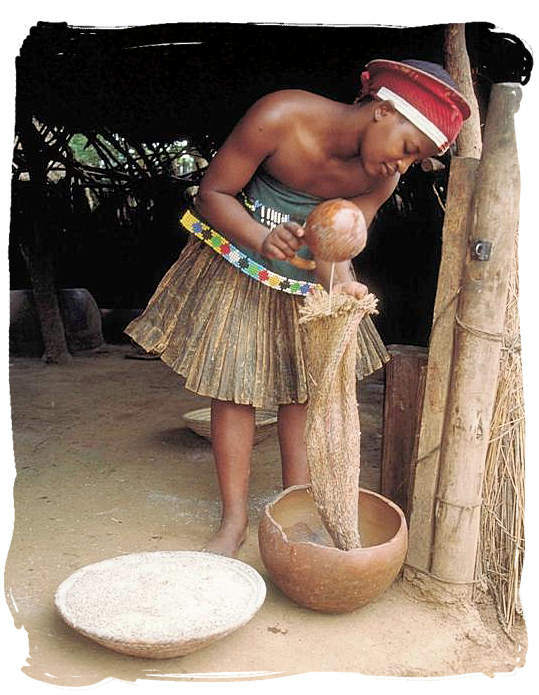 Zulu lady making traditional African beer. From the early days sorghum and millet have been mainly used for the brewing of traditional African beer. 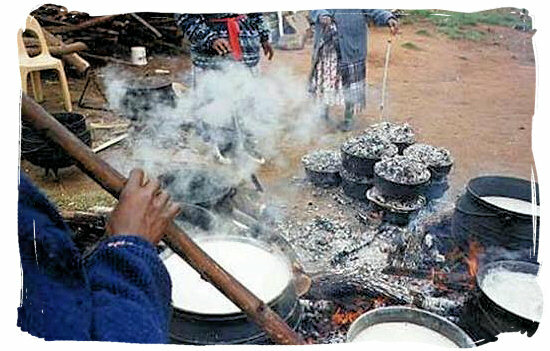 Sorghum mixed with maize meal, water and yeast produces "umqombothi", a popular home brewed beer rich in B vitamins. Mixed with flour, water and yeast it produces the well known and also popular "Mageu". Both are slightly fermented but not highly intoxicating. They are regarded more as food then anything else and the sour taste is highly refreshing. "Mieliepap" (maize porridge), Skop, Mashonzha and Amanqina, traditional dishes favoured by most black South Africans and also enjoyed by many whites. A traditional treat favoured by most black South Africans. Many white South Africans also love it, especially those with a farming background. It consists of those parts of an animal that are left over from cutting up a carcass, they are also called variety meats. Some come from inside the animal, such as liver, kidneys, brains, stomach and lungs, while others are external like tong, tail, feet and head. 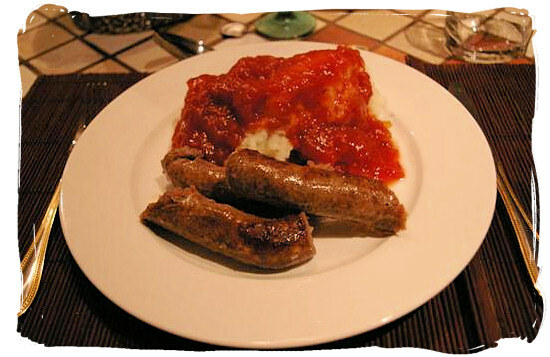 In the Cape it is considered a regional delicacy and is often served lightly curried, with potatoes and fired onions. Wandies Place, a traditional African restaurant and one of the "not to be missed" tourist attractions in Soweto. Sweet potatoes are the African equivalent of potatoes and can be fried for chip, used to make mash or cooked in their skin in the fire. A very tasty restaurant variation is to cook sweet potatoes, mash them with butter, sprinkle them with roasted peanuts and top it off with a squirt of honey. A favourite among the Xhosa people and said to be one of mr. Nelson Mandela’s favourites. It is "samp", broken dried maize kernels mixed with beans. After boiling for three hours butter, onions, potatoes, chillies, lemons salt and some oil are added after which it is allowed to simmer on low heat until all ingredients are tender and done. 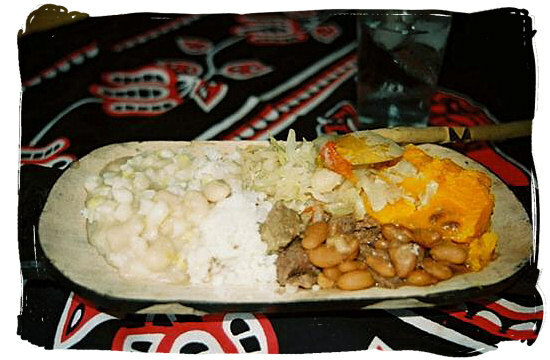 Typical Xhosa or Zulu dish consisting of samp, rice, beans, pumpkin and cabbage, almost like Umngqusho. Morogo is anyone or a combination of more then one of 150 different types of green edible leaves, including bean and beetroot leaves. Delicious when boiled and served with "mieliepap" (maize meal porridge), in combination with braised onions and tomato. It’s getting the thumbs up in more and more gourmet restaurants. A hoof of a cow, pig or sheep. it is boiled, then spiced for taste. Very delicious but sticky. Also known as Mopani worms. They are similar to caterpillars in Appearance and have established their habitat in and around Mopani trees found in the Lowveld areas of Mpumalanga and the Limpopo provinces. Popular with the Shangaan, Venda and Bapedi people. Somewhat stringy, they are fried, grilled or cooked, spiced with chilli and often eaten with peanuts. "Mashonzha", cooked Mopani worms spiced with chilli. A dish favoured by the Tswana people in both South Africa and Botswana. It is a sour porridge made of sorghum, great for breakfast. Head of Cow, sheep or goat. The head is first scrubbed with a sharp instrument like a razor to remove skin and unwanted parts like ears and nose are then cut out. The head is then boiled and allowed to simmer. Favoured by African men. 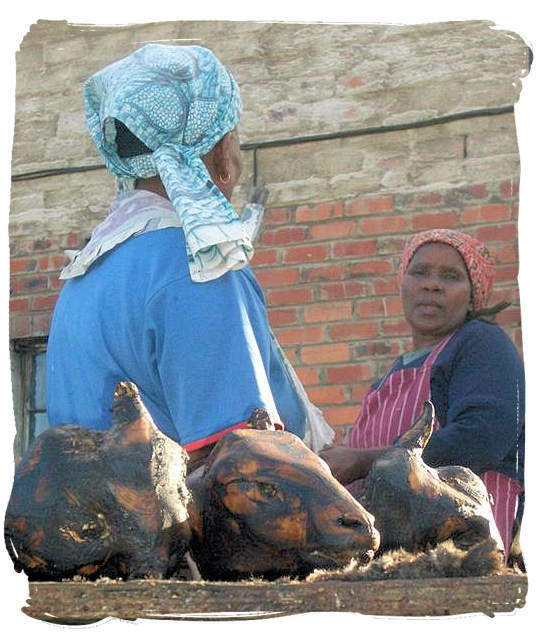 "Skop" or Grilled sheep heads for sale. 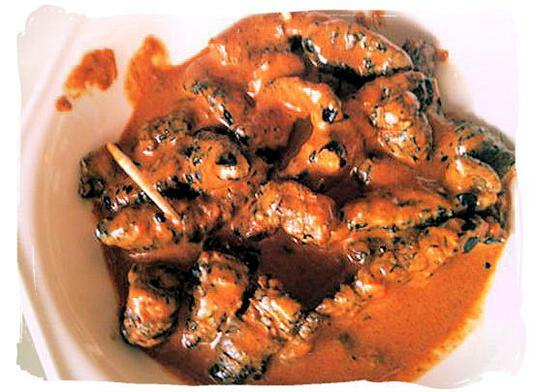 There are a considerable number of restaurants in South Africa serving traditional African food. "Moyo" in Johannesburg serves specialities from all over Africa, the North in particular. 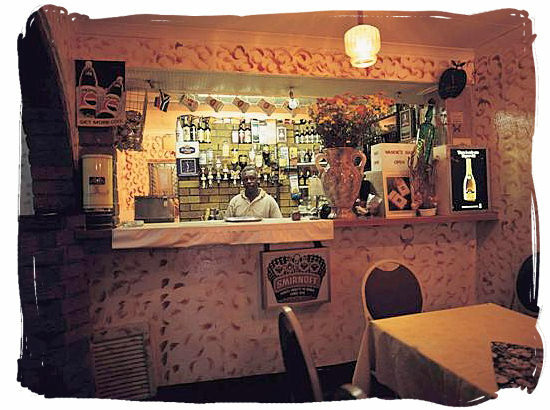 "Wandie's" in Soweto has become an institution thanks to its vibey atmosphere and "The African Café" in Cape Town highly popular. 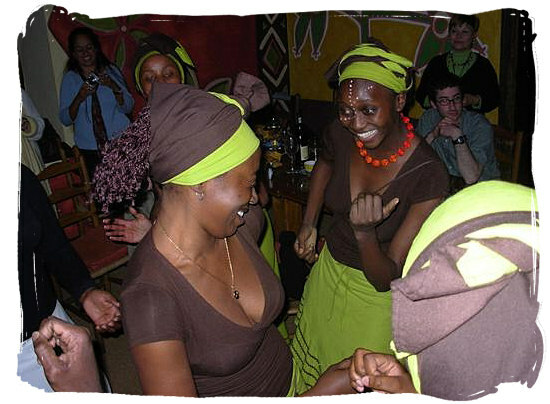 Dancing waitresses at the Africa Café, traditional Africa restaurant in Cape Town. 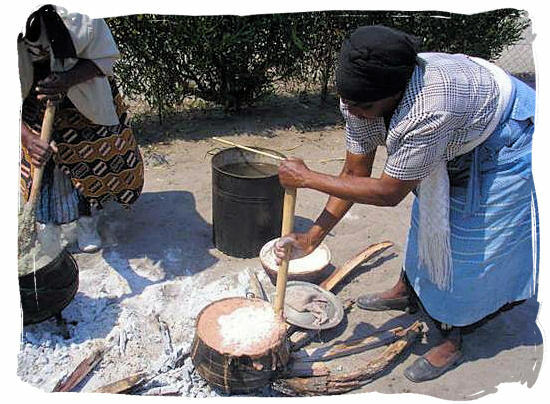 Traditional way of cooking "mieliepap" (maize porridge). The porridge should be smooth and runny. Stir in the butter just before serving. Serve with milk and sugar. Heat water and salt to boiling point. Pour all the maize meal in the boiling water, making a heap in the middle of the cooking pot. Do not stir. Put the heat on low, cover the pot and let simmer for 5 minutes. Then stir the porridge once with a large fork until crumbly. Don’t stir again. Cover the pot again and continue simmering for another 30 to 45 minutes on low heat. Stir in the butter and serve with a spicy sauce or meat stew. Alternatively serve with milk or buttermilk and sugar or syrup. Heat the water to boiling point. Pour all the maize meal in the boiling water, making a heap in the middle of the cooking pot and stir straight away. Put the heat at its lowest and stir every 5 minutes. Keep the cooking pot covered in between. The porridge should rather steam then simmer until it’s done. Serve with a spicy sauce or meat stew.